I know, I know — washing your face with oil sounds downright nutty. After all, we’ve been led to believe that oil should be kept far, far away from our faces. For years, we’ve scoured skincare product labels for the words “oil-free” before giving them the green-light to make contact with our skin. Yet oil has been used in natural skincare for ages, and is certainly making a comeback. Many natural beauty aficionados swear by the Oil Cleansing Method as a way of keeping skin clean, clear, healthy, and vibrant. I myself am totally obsessed with face oils, and credit them for transforming my skin and helping me finally get rid of my adult acne! Exactly what it sounds like: a means of cleansing the skin with oil. The Oil Cleansing Method is based upon the principal of like-dissolves-like—the oil used to cleanse the skin dissolves the oil on the skin. Now you may be scratching your head and thinking, “But I have acne. Won’t oil just clog my pores even more?” Well a zit is nothing more than a sticky mess of sebum and dead skin cells and/or dirt. And since like dissolves like, the oil cleansing method can actually help to break up this sticky mess and clear it from the pore. Will the Oil Cleansing Method make my skin a shiny mess? The Oil Cleansing Method can actually help balance your skin’s natural oil production. Putting oil on your face can “trick” your skin into producing less oil since it thinks it already has enough. And often, the skin produces excess oil if it is dry—by thoroughly moisturizing the skin, the Oil Cleansing Method helps prevent the sebaceous glands (which create face oil) from going into overdrive. How do you “wash your face with oil” using the Oil Cleansing Method? Splash some warm water on your face, then gently pat dry. Dispense a quarter-size amount of oil into the palm of your hand and gently massage it into your face for 1-2 minutes, especially focusing on those areas with clogged pores. Wet a washcloth with hot water (you want it as hot as possible without burning your skin), ring it out and lay it on top of your face. Quickly lay a second dry washcloth on top to trap the moisture and heat. Let it sit for 1-2 minutes, or until the wet washcloth cools. Repeat, using the dry washcloth to gently wipe your skin at the end. If your skin feels tight afterwards, follow up with a small amount of moisturizer. However, you likely find that you don’t need to moisturize at all since the cleansing oil will settle into the skin, providing moisture. Which oils are best to use for the Oil Cleansing Method? It’s best to use a blend of an astringent oil and other nourishing oils based on your skin needs. I personally choose to avoid using castor oil due to possible environmental and human rights implications. It can also be extremely drying and so finding the perfect amount for your particular skin can take a bit of trial and error. However, it is the astringent oil you will most commonly see in Oil Cleansing Method oil blend formulas. There are so many AMAZING skincare oils out there, each with different benefits. Read The Best Carrier Oils Based on Skin Type to see which oils may be the best fit for your skin needs. If you have tried the oil cleansing method using coconut or olive oil—two of the most commonly suggested oils—and were disappointed in the results, I suggest giving it another go! These oils can clog pores and so do not provide the best results for everyone. How long will it take for me to see results with the Oil Cleansing Method? It may take a week or so for you skin to adjust to the Oil Cleansing Method. As the oil breaks up the gunk in the pores, you may even experience more breakouts during this time. Try to wait it out and resist the urge to use regular facial cleansers during this time, which will prolong the adjustment period. You will also likely have to experiment with the best oils and oil ratio for your skin. Have any advice or input based on your experience? What type of astringent so you recommend or is it a diy remedy? I have used the oil cleaning for several months and I love it! I dont wear make up anymore and my skin has never looked better. I like to clean with jojoba or grapeseed and moisturize with rosehip seed oil with geranium essential oil added. I started doing this last week, and my skin did break out that first week, like you said, but it’s definitely starting to clear up, and my acne scarring is even fading (I use a combination of Jojoba oil and Rosehip Seed oil, which is know to lighten scarring). I keep thinking I should add some castor oil because I am still breaking out a bit. But trial and error. So far I really like it. Thanks for your feedback, Beks! I’m glad it’s working for you. Keep us updated if you add an astringent oil like castor or hazelnut and how that impacts the results. Cathreen, that’s awesome! And that sounds like a winning combo of oils right there. Doris, I’m not entirely sure of your question. Are you referring to the types of astringent oils you can use in your Oil Cleansing blend? Hi, I have still not used the oil cleansing but am inspired to start. Currently using a body shop cleanser and a combination of aloe vera,rosehip oil and tea tree oil to nourish as I have oily skin. Can you please suggest combination of oil cleanser for me and also something to deal with pores. Hi Nadia! I was just wondering if this method works to remove makeup as well or should I clean my skin first and then apply? Yes! The Oil Cleansing Method removes makeup very well. Good question – I should clarify this! Do you use the DIY facewash you make and washing with this oil method? If so how do you balance it? I’m really enjoying the oil cleansing method. I’m using jojoba and rose hip to cleanse and moisturizing with sweet almond oil. I do have some scarring and wondering where I should add the tamanu? In the cleansing or moisturizing? Hi! I haven’t tried the oil cleansing method yet, but I really want to! My only problem is there is so much info on which oils to use for different skin types and issues, that I find myself super insecure on what to choose. I have dry skin,slightly sensitive and blemish prone along jawline and chin (mostly around that time of the month). Do you have any suggestions on where to start? How long does it take for your face to stop producing excess oil? I started a few days ago and after about 3-4 hours I feel like I’m a greasy mess. Hello everyone! I cleanse my face with coconut oil for ages. It is so effective for make up especially around the eyes and it doesn’t sting at all and that’s a bonus. Now I want to try jojoba oil. We’ll see if it’s as effective as the coconut. 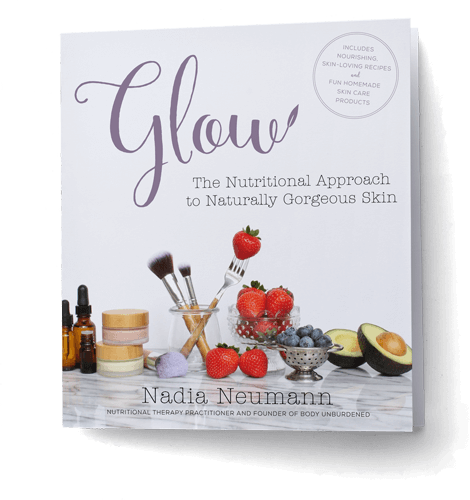 By the way, Nadia I ran into your blog by chance yesterday searching for natural solutions to get rid of my 11 yo daughter’s acne and I found you with treasures of amazing recipes. I didn’t try them yet ( I have to order first the bentonite and charcoal ;)) I didn’t even heard bout that clay. Hi, could you please clarify which step or steps we are supposed to repeat when we do the oil cleansing method? Thanks! For years (like 20) I’ve been using extra virgin coconut oil and a baby wipe to clean my face, every night. This never dries my skin, completely removes makeup better than any soapy product I’ve used, including Cerave’s cleanser, Cetaphil, etc. Since I’ve been using it so long, I now have my 11 year old daughter hooked on this and while she’s starting to break out, it’s nothing awful yet. Once I switched to coconut oil I stopped having the horrible deep zits that were almost cystic that would show with my monthly cycle. Every day of the year, even in the hot summer, I feel like I get it all off with coconut oil, but none of the tight irritated skin after. I do want to note that I rinse the baby wipes (always unscented) since they tend to irritate my eyes when I wipe off eye makeup. Seems counterintuitive, but it really works. I have always been a huge fan of the oil cleansing method, but I did not have a great experience with it. I did use olive oil and coconut oil the two times I tried it. I also have moderate to severe rosacea. Is the oil cleansing method good for rosacea? Which oils are best? Should I use the Combination skin recipe? Hi Nadia! I just posted a question on your “Why coconut oil should not be used on your face” post, but I realized I may not have been specific enough in my question. I have tried oil cleansing for almost 3 months now, with great results initially, but now my acne is way worse. I’m using a blend of 10/20/70 castor oil/hemp/jojoba. My forehead acne is painful and just won’t go away. I am considering trying a different blend, but it costs so much money to buy different oils and what if the new oils don’t make any difference or are worse. I purchased your oil blend for moisturizing and love it, but I feel like it’s too expensive to use for cleansing as I need significantly more for that. I have tried so many options and nothing seems to work. I feel so overwhelmed and don’t know what to do next. I’ve done the work for internal healing I have been working with a nutritionist/chiropractor for almost a year with supplements tailored to my body based on blood work. 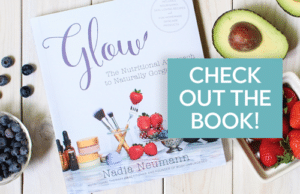 I have your book Glow and love it. I have been on a very restrictive diet (now doing AIP elimination diet). I have detoxified my house, my water, and all my beauty care products. But I just can’t get rid of this acne! I am so discouraged and frustrated! Please, can you offer me any insights or suggestions? I would be so grateful!!! I trust you more than any other blogger out there on this topic. Michele, I SO definitely want to help you but there’s only so much I can do with this limited info and here in the comments section of the blog! I will shoot you an email about possibly setting up a 1-on-1 consult as I know that will be the only way to truly help.